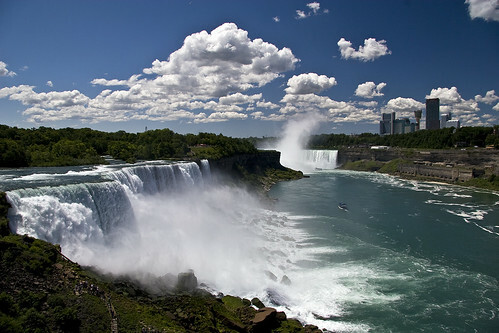 July 21st I went with the family to visit the mighty Niagara River to see the falls. I was also hoping to do a little surveying while I was out. We had a great time exploring Goat Island, taking a voyage on the Maid of the Mist, and walking to the foot of the falls in the Cave of the Winds. I did not find one dragonfly though! I’ll admit I wasn’t preforming an extensive survey, but the whole day I did not see a single ode. I would assume that this is because the rapids are so violent. I also do not know what flies on other parts of the river. Has anyone done any surveying above or below the falls? I have been very bad about updating lately. Thats because of some changes in my life right now. I took a job in Medina and am in the process of moving to Lockport. Because of this I have not had time for much surveying this summer, but the upside is that I now have four more counties that are easily accessible. I just have to find places to go! Today was the first day I ventured out at lunch. I stopped at a small stream running through a park in Medina. From the car I saw many Powered Dancers, but nothing else. I suppose I’ll need to get out of the car and do some walking soon. Here are the results of my last two “real” surveys. The nature pilgrimage was great this year, but the best part of my weekend was not spent in a organized workshop, but at Red House Lake and a few Beaverponds. Here are my lists for the weekend. The Common Sanddragon is currently only known from two rivers in the Adirondacks. I found it during the Nature Pilgrimage at Red House Lake. This was one of three lifers I got over the weekend! My other two lifers were the Beaverpond Baskettail and Clubtail. I also observed some other interesting ode behavior I will write about soon. I had a nice morning walk at the Jamestown Audubon today. The first part of the morning I had fun looking for wildflowers with Jeff, one of their naturalists. He showed me a most beautiful Pink Ladies Slipper. After that I spent an hour looking for dragonflies. I got most of the usual ones for this time of year. I have been looking forward to sunny spring days all winter long. One of my many reasons was a smallish dragonfly called the Ebony Boghaunter (Williamsonia fletcheri). These are a rare dragonfly that are typically only seen in bogs. 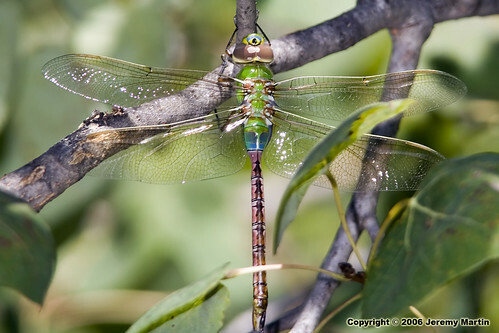 They are old dragonflies that are thought to be left over from a colder period before temperate forests moved north. I invited Mon@rch to come along with me. I always enjoy have people much smarter than myself along. It save a lot of time in your field guide, and you learn all sorts of new things. As usual I was not disappointed. Tom is a wiz with birds, and had no problem blowing my mind by identifying them all with out even seeing them. He would hear a song and call out a name, then we would match a bird with its song. It always amazes me that I could walk by so many different types of birds and never know what I had missed. The warblers that we saw were so colorful. If I keep walking with Tom I might just give up the net for a pair of binoculars! While the Allenburg Bog is a great place to hunt for dragonflies, I did not find my Boghaunter. It may have been too early in the season, or they may just not be there. It may have even been to early in the day as we left before noon. I will just have to keep looking another day. We did manage to scare up a Common Green Darner, my only ode species for the day. A trip to the bog always gives a great wildflower show. I found my first blooming trillium and gold-thread for the year. 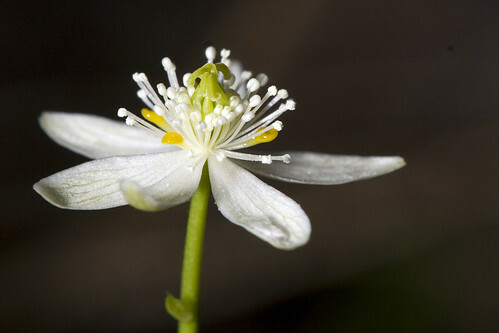 We also saw Trout Lily and Spring Beauties. Lots of others have not started to bloom yet. I’ll leave you with a few shots. Today we took advantage of the nice weather and went for a walk at the Jamestown Audubon Society. I was hoping to find some Eastern Forktail damselflies, but instead found a much larger critter. 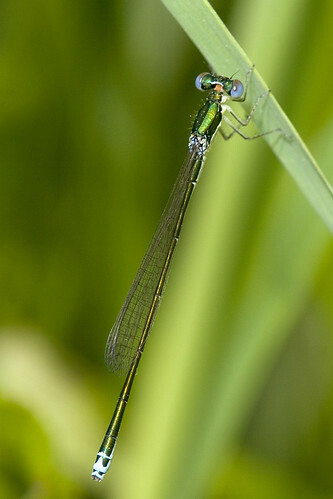 The Common Green Darners were flying around the ponds. I even got to see a few tandem pairs. They were flying around before the cold spell hit us two weeks ago, but I never got to see them. They are typically the first dragonfly of the year. This is because they are one of the few that migrate. I didn’t get any pictures, but I will leave you with this one from last year. Even though it is still snowing outside I was still able to find a new Chautauqua County dragonfly record. 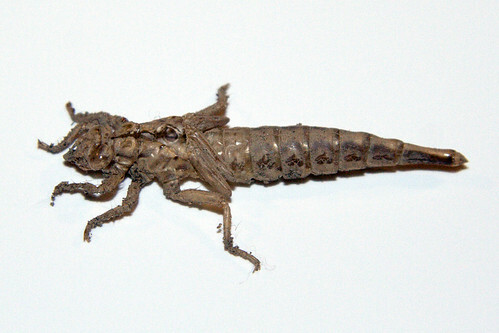 Last year in late July I happened to pick up an interesting dragonfly exuvia. It was on the side of a concrete bridge embankment. It has been sitting under my monitor ever since. I happened across it again last week. I decided to ask the Northeast Odonates list serve on Yahoo. 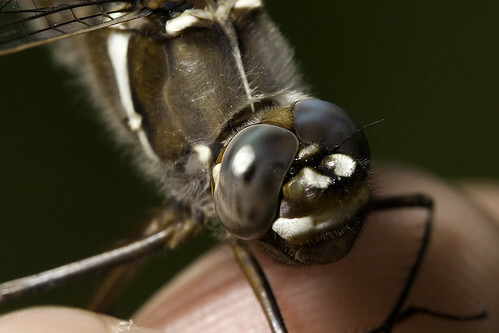 This is the place to go if you have questions on anything involving dragonflies. My inbox started filing up imediatly with responses. They all said one thing “Stylurus spiniceps (Arrow Clubtail)”. This is an intesting dragonfly. It is one of the Arigomphus clubtails. They are rarely seen “on the wing” since they spend most of their time in the upper canopy of trees where they make quick flights to snag passing insects. Most records actually come from exuviae which are quite easy to find. In New York this is a species of special concern. This brings me to a new project that I will be working on next year. I have decided to try my hand at raising dragonfly nymphs next year. I was inspired by Nick Donnelly’s article in the Spring 2006 Boghaunter. This is a great way to survey rivers and streams. I’ll keep everyone posted on how it turns out. The large amount of snow that we have been getting has had one upside for me. My backyard bird feeders have been as busy as I have ever seen them. I live on a small plot (~150ft x 55ft) that is right in the middle of town. Most of the nature I get to see is mice and squirrels. Shortly after I moved in I started putting up bird feeders. Now I have quite a collection in the backyard. They have been relatively dead all winter. I had a juvenile Coopers Hawk that spent the winter feasting on the pigeons that lived in my neighbors attic. Either the songbirds got smart or got eaten, but either way they weren’t eating at the feeder. The day after the snow though my feeders came to life again. 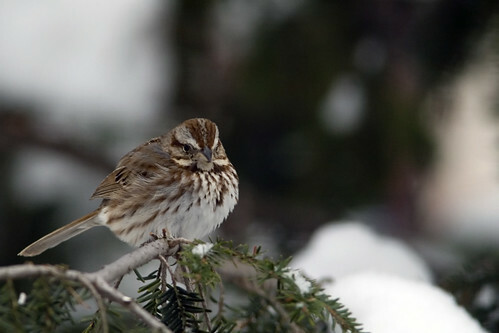 I saw all my old friends, the Slate-colored Juncos, the Chickadees, and the ever present House Sparrows. I also got a few greedy Blue-Jays and a pair of the always stunning Cardinals. At the suet feeder I started seeing the Starlings again, and the Downy Woodpecker even dropped in for a snack. I also saw a lot of sparrows that weren’t house sparrows. I decided that it was a great time to grab the camera and find out what I was looking at. 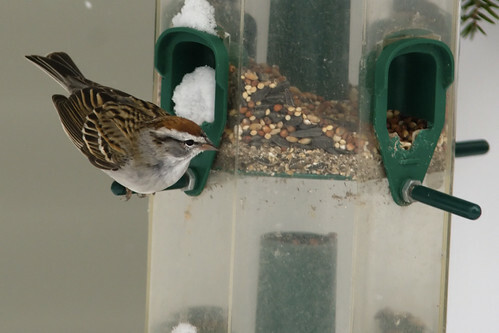 After snapping a picture of ever bird that I didn’t recognize and then breaking out the field guide I found that three new sparrows were at the feeder, the Chipping Sparrow, the American Tree Sparrow, and the Song Sparrow. There may have been more, but I didn’t feel like I had enough knowledge to ID them correctly. Slowly I keep learning the names. I find that when I can assign a name to something I am much more interested in leaning about it. You can believe that I will be reading about my three new friends in the coming weeks! I had the day off of work for Good Friday. Since we have a foot of snow on the ground right now, we decided to take Noah and his cousins over to the Audubon to get out of the house. The Jamestown Audubon is a second home for us most of the summer. Karen & I always enjoy walking the trails. We have also met many new friends who share our interest in nature and photography. I am active in their photo club and also do a lot of my dragonfly research there. On the first floor of the building they have a wonderful area to look at the bird feeders that they maintain. The diversity of birds and the ability to get close makes this a great place to do a little indoor photography out of the cold. Today seemed to draw in all sorts of birds. I was most impressed with the variety of woodpeckers that I got to see. In addition to the regular Downy and Hairy woodpeckers, we also saw a Yellow-bellied Sapsucker and a Red-bellied Woodpecker. This was the first time I was able to photograph these two species. We were also treated with a nice view of four Whitetail Deer that came for a quick meal. They were spooked almost as soon as we were able to see them, but the kids sure were excited. We were also treated to the regular Cardinals, Blue-jays, and LBBs (little brown birds). Someday I will know my birds as well as dragonflies, but that day is still a ways off. Until then enjoy these pictures! Spring has got to be my favorite time of year. It seems like every day a new nature event is taking place. I find myself impatiently waiting for the first dragonfly, but I know I have another two or three weeks until the Common Green Darners come back and the Eastern Forktails emerge. Until that time, I keep myself busy with other persuits. 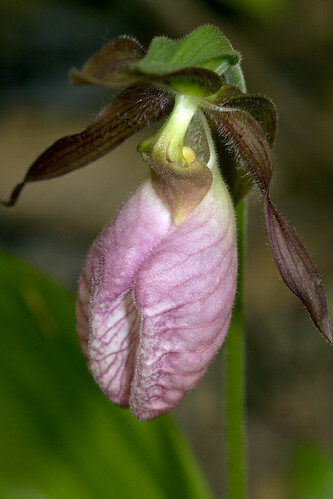 I found wildflowers last year, and have manged to learn a little and enjoy them a lot. This year I have been busy with “herps” as all my friends down at the Audubon call them. Walking through the woods behind the factory I work at I found my first snake of the season, a garter snake. 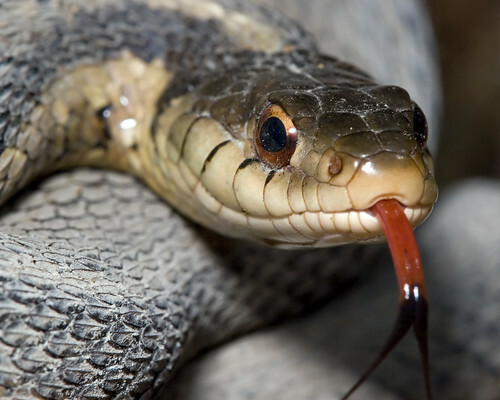 My friend Jennifer Schlick gave me a little tidbit on these guys, all garter snakes have a red tongue with a black tip. If you would like to get more fun nature facts just click on her name and it will take you to her new blog. 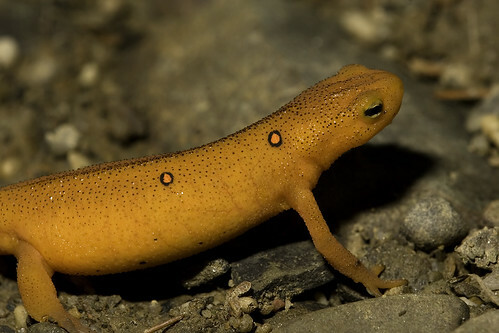 A very exciting first for me this year was the salamander migration. I have never seen this before, but the way that people talk you might think that it is better than Christmas. Well I managed to miss the first night mostly due to my complete ignorance on the subject, but the next night I was still able to get out and see some spotted salamanders. These are really fascinating animals. My friend Tom did an amazing job writing up a blog entry on them. 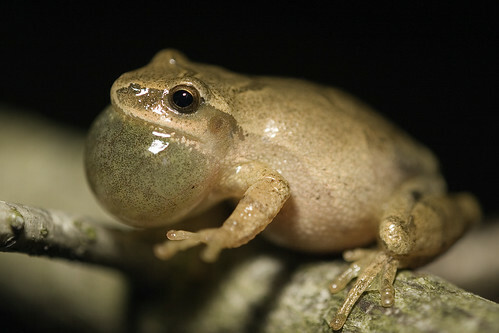 I also saw my first spring peeper! Who would think that such a little frog could make such a big noise?